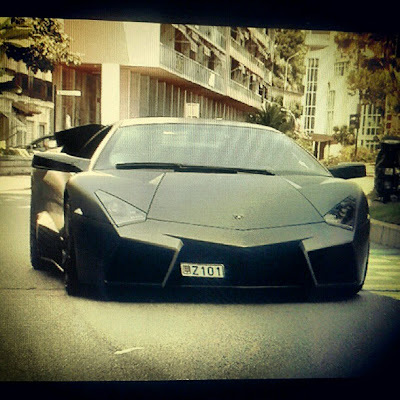 We rarely hear about the Lamborghini Reventon spotted on the road even if it came out in 2007. It cost 1m € and just 20 of these have been produced, making it a very rare car for collectors that passes most of its time under a cover in a dark garage. When there's one of those on the road, there will be certainly some pictures or videos later on internet, it's a supercar that really doesn't go unnoticed and it's a dream for most spotters to catch one! YouTube user Fipeux has been lucky enough to spot his second Reventon on the road, this time driving around Monaco. Just to refresh your mind, the Reventon has a massive 6.5L V12 engine that produces 650hp, enough to move it up to 330kph and from 0 to 100 kph in just 3,4s. ..thats rare..but why is the light flashing .